Here she is! The newest little addition to my household is finally here, and to say I'm obsessed with this little cutie is an understatement. Khaleesi (her name, and yes it's from Game of Thrones 😉 ) is a blue merle australian shepherd puppy and is a little over 2 months old. Although she's my roommate's dog, I've definitely had a lot of the responsibility for her these past few days! But my roommate gets overnight duty where she deals with the crying, so I'm thankful I don't have to deal with that. I just get all the play time, cuddles, and the occasional bathroom mess. Sometimes I just catch myself staring at her because she's too cute to even be real! But then she reminds me of her flaws when she pees on the floor, potty training is very difficult, haha! In the end though she is so worth all the trouble, and is the most cuddly pup you will ever meet. She is so sweet, barely makes a peep unless she's playing tug of war, and loves to be held. It's so funny to watch her bounce around, chew on her toys, and then slump over into a nap (did I mention she LOVES to nap??) My favorite thing though is to watch her go upstairs, because she gets so confused as how to get down! Do you have a pet? Did you ever potty train a puppy? If so I would love any tricks and tips!! Also you can follow Khaleesi on Instagram if you want to keep updated with tons of cute photos! Oh em gee what a cutie! My friend has an australian shepherd and shes so energetic and fun! Ahh what a cutie pie!! I love the name, too! Congratulations on your new addition! Omg she is literally the cutest! I want a puppy so badly!! Oh my goodness I could look at these pictures all day! Aww! Khaleesi is the cutest! oh my goodness- what a little sweetheart! We have a mini australian shepherd and its the best dog. Such a pleaser! I'm not even a dog person and I think she's so adorable! Haha. Ooo such a cutie pie! Oh my goodness! 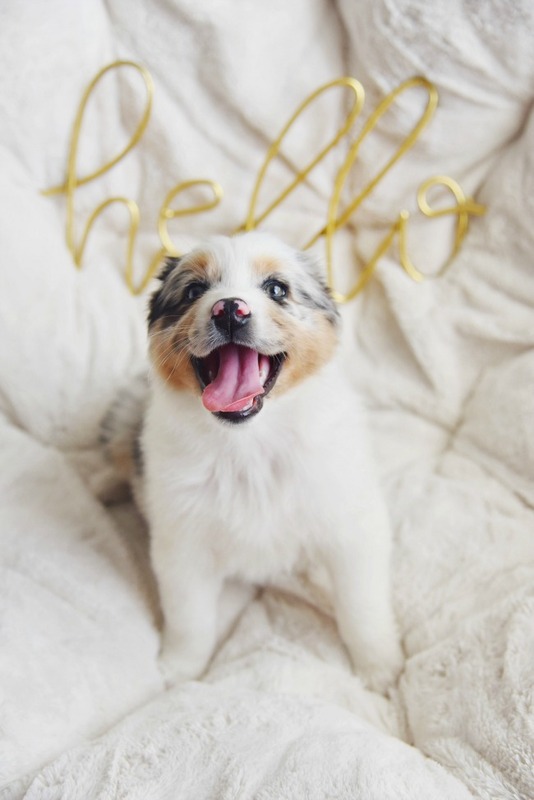 Hi sweet girl :) Cannot wait to see more of Khaleesi on your blog! OH MY GOSH!!! How precious.... she is so beautiful! This dog is so darn cute!!! We just lost ours in September so we aren't quite ready for a new one yet. But, when we are, this breed may be one we consider!! Ahhh what a cute little nugget! I love the color of her eyes - so pretty! What a cutie! I love her name!! !